This might be the one of last big rain and storm systems for this season. While Victoria is forecast for snow down to 1000 meters, the cold front will also tap into a vast amounts of moisture and remaining heat through QLD and NSW. While a few people could miss out on the rain, forecasts suggest that a majority won’t. Given the recent results from Ex TC Trevor that were focused through Central inland parts of QLD, this next system should fill in the blanks further South and East. Widespread 15 to 30mm is expected through the Eastern 2/3rds of NSW and Eastern 2/3rds of QLD during the next 3 days. Some higher rainfall totals are very likely under heavier storms and rain areas. QUEENSLAND: The front will fire up a line of storms from Friday afternoon from the QLD Gulf down through the Central West down into Southern inland districts. This could spread to overnight rain and thunder through Central and and Southern inland districts. On Saturday the band pushes East into the South East inland, South East Coast, Central inland, Central East and Northern Tropics. Some storms are likely to become severe with heavy rainfall and damaging winds. Hail can’t be ruled out due to cold air aloft. 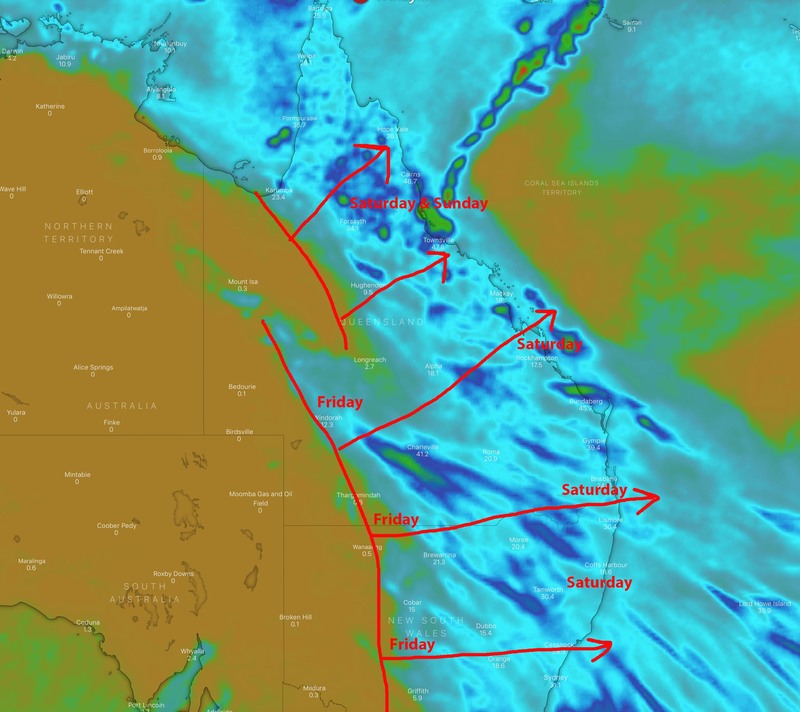 On Sunday a much drier cooler airmass spreads across Western, Southern and Central parts with remaining rain and storms focused over the Northern Tropics. NEW SOUTH WALES: During Friday, a front is expected to fire up some storms across Northern VIC and Southern Inland NSW. These could spread into South East areas as well as loosely covering Northern and Central Inland areas later in the day. Overnight, storms should turn to rain areas and spread East across Northern and Central NSW, clearing the Southern Coast. During Saturday, activity should clear the Central Coast with further storms firing up across North East areas during the late morning and early afternoon before clearing the Norther Rivers during the early to mid afternoon. Widespread good falls are expected across Eastern NSW during the 2 days. Snow is also likely across the Alpine regions of VIC and NSW. During Sunday, its expected to be a cold start to the day across a large portion of NSW, especially along the Ranges, before mostly fine conditions take over. Detailed rainfall and thunderstorm forecast maps are available for SEQLD, QLD, NSW, ACT & VIC through our Premium Service HERE!